Tyler Butterfield reverts back to the triathlon on Sunday after his May 24 half-marathon success. *Photo by Kageaki Smith. Tyler Butterfield, fresh from his maiden May 24 half-marathon triumph, will be the headline act at the Tokio Millennium Re Triathlon on Sunday. The Bermudian Olympic triathlete is the overwhelming favourite to defend his title at Albuoys Point in Hamilton. The 30-year old is keeping himself in shape back home on the island as he gears up for an assault on the Ironman World Championship in Kona, Hawai’i in October. He says the sprint distance this weekend — 750m swim, 20km bike and 5km run — will still test him, and he was at pains to support an event hosted by his main sponsor Tokio Millennium Re. As well as the Open category, there are other options — the Try-a-Tri, Junior Advanced, Senior Individual and Team. And Butterfield told the Bermuda Sun : “My last triathlon was in March in the Ironman in Australia, so this is the other end of the spectrum with the sprint distance. It’ll be nice to get out there and enjoy the day. It’ll be a lot of fun. “This one will hurt because it’s fast — but Tokio are incredible to allow me to race around the world so it’s the least I can do to come back and support their race. As well as the opportunity to add to his victory haul, the event is also a chance for Butterfield to repay his sponsor’s faith in him. He said: “All year they basically let me do what I want and they don’t ask very much of me — they give me a lot of support. 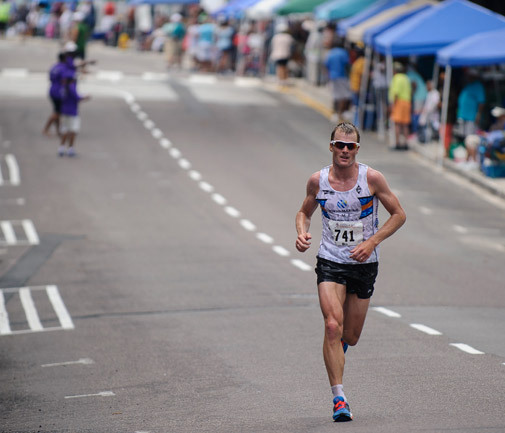 The bigger picture for the two-time Olympian is the Ironman in Hawai’i — and he admits the half-marathon race was, despite the win, a stark reminder that he can’t afford to get lazy. He said: “I was realistic because I knew the time wasn’t going to be my fastest but I was still hoping to have a good run. “It was good for me to do a hard run that I had done before so I could gauge how fit I was. I knew I wasn’t going to run a 1hr 11 like I did before. I thought it would be more of a 1:14 or a 1:15 and that’s what I did — but I wasn’t really happy with how much it hurt and I pulled up pretty sore the next day. It was a wake-up call not to relax too much now when it 21 weeks — now 20 — away from Kona. “It hurt more than it should have – I should have been able to do 1:15 comfortably and I can’t say it was comfortable. Butterfield has two qualifying races to get through before his Ironman participation is rubberstamped. And he believes the humid air in Bermuda at the moment is perfect conditioning. He said: “I’m just making sure I’m fit enough to make sure I can handle the time when I turn the training on. I’m keeping things fun and light-hearted, doing plenty of open water swimming and making the most of Bermuda.